This follows a successful meeting between President Bio and the European Commission President Jean-Claude Juncker yesterday. The 73 million euros funding forms the basis of three Financial Agreements signed between the European Commission and the Government of Sierra Leone to support Sierra Leone’s inclusive and sustainable socio-economic growth and strengthening of democratic governance. 45 million euros will be allocated to the State Building Contract which represents the second phase of the European Commission budgetary support to the Government of Sierra Leone; 23 million euros will support Civil Society Organisations and local authorities to fund and implement development initiatives that respond to the priority needs of communities in a sustainable way; and 5 million euros will be allocated to the Sierra Leone Component of the West Africa Competitiveness Programme to enhance the country’s integration into regional and international trading systems. During the bilateral meeting, President Juncker praised President Bio for his impressive leadership and admirable commitment to human capital development, reform agenda, fiscal discipline and efficient economic management. 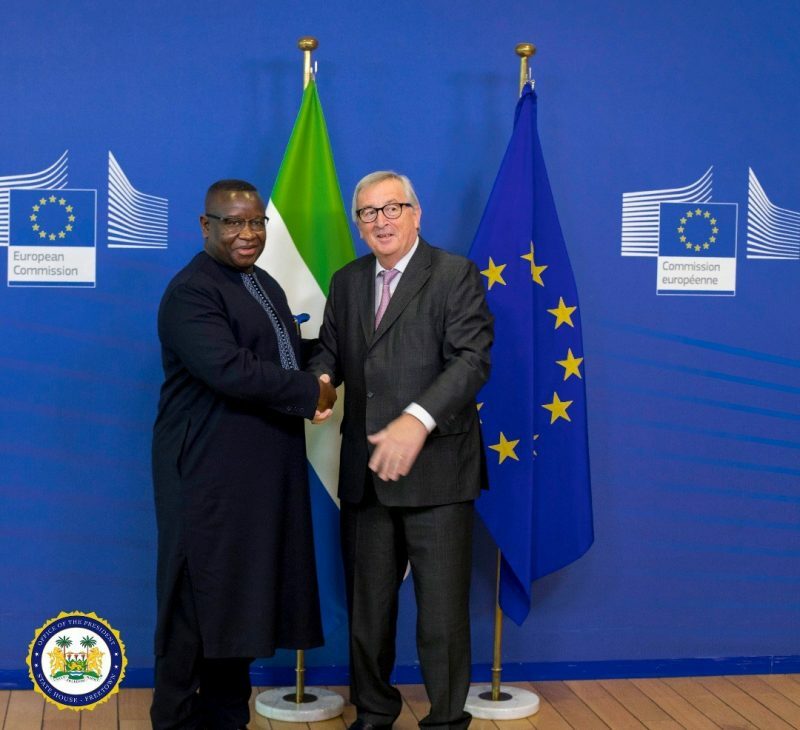 As the leading champion in Africa on the fight against corruption and democratic accountability, President Bio was also lauded by the President of the European Commission, Jean-Claude Juncker: “I can only support your fight against corruption. This is good for your country and the European Union. You have the full support of the European Union in the fight against corruption.” President Julius Maada Bio thanked the European Commission President for the EC’s support to his new administration and committed to strengthening relations with the European Commission. Sierra Leone will also benefit from the Erasmus + Programme which offers opportunities for non-EU individuals and institutions in the areas of education, training, youth and sport.Additionally, Sierra Leone will benefit from the 10 million jobs to be created by the European Union for young people in Africa, aimed at addressing the migration of young people to Europe in search of job opportunities. President Julius Maada Bio had lunch with the Secretary General of the European Union External Action Service, Helga Schmid. After lunch, he held bilateral meeting with the European Union Commissioner – Karmenu Vella responsible for the environment, maritime affairs and fisheries. This huge financial commitment by the European Commission to support President Bio’s New Direction Programme, and his several engagements with senior officials of European Commission demonstrate the tremendous goodwill and confidence the international community has in president Bio and his fledgling government. All eyes are now on the International Monetary Fund (IMF) to release the $200 million finance package currently being re-negotiated with the Bio government, after the IMF cancelled its agreement with the former Koroma led APC government late last year, due to rampant corruption and economic mismanagement.